This is a guest post by Griffin Burgess, ZSFG Archivist. The Zuckerberg San Francisco General Hospital Archives has its first collection available as part of UCSF’s digital collections on Calisphere! The collection consists of over 100 digitized images scanned from 3 x 5 cellulose acetate negatives that date from the 1930s. The images document the exteriors of the hospital buildings as well as interior rooms, hallways, equipment, and staff. The ZSFG campus looked very different in the 1930s than it does today. These images capture the arrangement and layout of the buildings as they originally were when the campus was completed in 1915 (with the additions of buildings 80 and 90, which were completed in 1938). San Francisco General Hospital administration building and front gate. SFGH 2015 005, box 1, envelope 11. Buildings 1, 9, 10, 20, 30, 40, 80, 90, and 100, all of which are still standing today, are represented in the photographs. Notably, the large fire escapes that the four “finger wards” have along their north sides today are missing in the images; they were added in the 1950s. San Francisco General Hospital, view SE from above Potrero Ave, including buildings 30 and 40. SFGH 2015 005, box 1, envelope 4. The collection also includes images of the original administration building and the infectious diseases/tuberculosis building, which were demolished prior to the construction of building 5 in 1976. The TB building housed the chest clinic, where patients were treated for TB for up to five years. San Francisco General Hospital chest clinic technician with x-rays. SFGH 2015 005, box 1, envelope 37. 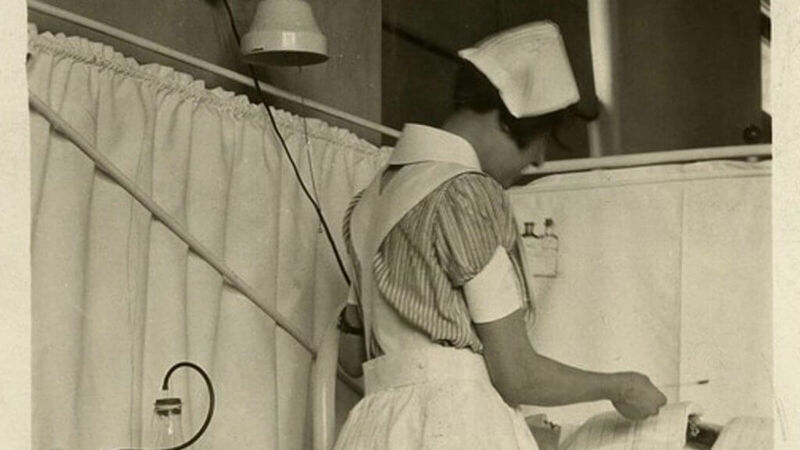 Other images document the interior of the hospital, including images of kitchen facilities, waiting rooms, and patient rooms with various types of equipment, such as medicine bottles, IV stands, and even an iron lung. Patient room with beds and an iron lung at San Francisco General Hospital. SFGH 2015 005, box 1, envelope 70. In the 1930s, San Francisco had several emergency hospitals throughout the city. The collection includes images of the exteriors of some of these, including Alemany Emergency Hospital, Harbor Emergency Hospital, Central Emergency, and Park Emergency Hospital (which still stands today at the eastern edge of Golden Gate Park). San Francisco Park Emergency Hospital. SFGH 2015 005, box 2, envelope 24. More ZSFG Archives collections will be added to Calisphere as they are processed. Showing equipment and the site of injection prepared. SFGH 2015 005, box 3, envelope 10.